FACES Ferran Adrià is a collection of innovative products for the kitchen and table developed by a team of industrial designers in collaboration with Ferran Adrià, a pioneer in molecular gastronomy who revolutionized the culinary world. TIME magazine includes him in their list of "The 100 Most Influential People of Our Time." 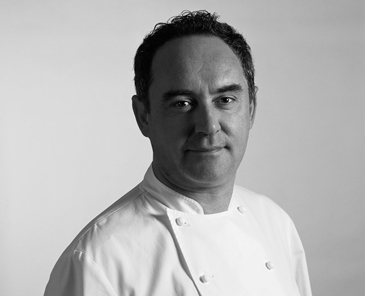 Ferran Adrià is the head chef of the #1 restaurant in the world, El Bulli restaurant in Roses, north of Barcelona, Spain. This restaurant is booked out a year in advance and is only open for six months in a year (April to September). In the other six months, the chefs are in their laboratory kitchen in Barcelona experimenting and devising new recipes and techniques for the following year. One of the principles of El Bulli is to offer the guest new sensations, through creativity applied in the kitchen, the search for original ingredients, alternative ways of using food products and through design of new utensils for eating. Ferran Adrià's creative strength together with the designers' unique talents, have resulted in this broad and diverse collection of unique and innovative pieces that respond to the new habits and needs in the kitchen and at the table. Each piece is carefully crafted from stainless steel and is dishwasher-safe (except for the 24-carat gold Straining Spoon). Each piece of flatware is handcrafted in 18/10 stainless steel. All knife blades are made of 18/0 stainless steel to make them more resistant and easy to sharpen. All pieces are made in Spain.